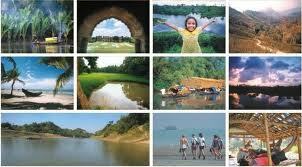 The aim of this term paper is to describe Prospects of Tourism in Bangladesh. It is the activity of persons traveling to and staying in places outside their usual environment for only one consecutive for leisure, business or any other purpose. From the type of this we are able to divide in the subsequent ways: Conventional Tourism and Eco-Tourism. Conventional Tourism includes the interest of people finding merely the panorama forest, animals, birds or observes this exotic people by keeping a distance. Another is offer tourists an opportunity to know the intimate lifestyle of different multiple people and this natural resources on the specific area.